I love to travel. Every year as a child, my family packed up the car and drove from Connecticut to Florida. It was a full 24+ hours in the car, but it created some of the best memories of my childhood. When Chris and I got married we created a “baby bucket list” of places we wanted to go before we took the plunge into parenthood. We went to Jamaica, Florida, California, Vegas, Hawaii, Puerto Rico, Dominican Republic, Italy and Greece. I think it was one of the best things we could have done for our relationship. I cherish the memories we made as a young married couple traveling the world. I want to pass on my love for traveling to my girls. 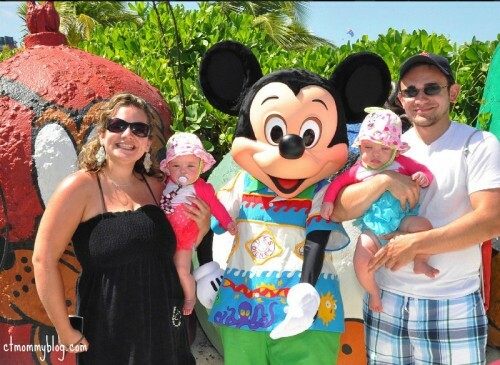 So when the girls were 8 months old we took a Disney cruise. The cruise left from New York (only 1 1/2 hour car ride away) and sailed to the Bahamas, Castaway Cay (Disney’s private island), and Orlando (Port Canaveral). Most people thought we were crazy for traveling with such young babies, but I didn’t want to stop doing something I loved just because I now had children. We chose the Disney cruise because we knew that it was family friendly. The cruise was wonderful. The staff was friendly and accommodating. They even made pureed baby food just like my homemade baby food. The itinerary gave us enough things to do without being overwhelming. But my favorite part of the whole cruise was that it didn’t involve flying. Fast forward to this March when Chris learns that he will have a conference in Disney. I thought this was the perfect opportunity to take our yearly vacation. We already knew that Disney is the most magical place in the world so it was a no brainer to start planning our family vacation, but this time we had to fly — with twin toddlers! The girls have been in a tantrum stage for the last few months so I was VERY concerned about how they would act on a 3 hour flight. In the end, I would like to say that we survived two flights with twin toddlers!! I did a lot of research prior to our trip and want to pass along what worked for our family. When picking your flight time there seems to be two schools of thought. The first group of people believe that you should fly during your child’s nap time. 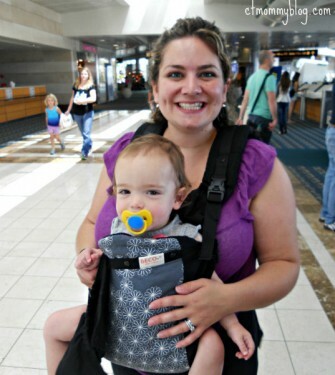 The second group of people think that you should fly when the child is well rested and alert. I like flying after a nap. Our flight to Florida was after the girls’ nap time. They had lots of energy and were wide awake. It took extra effort on our part to entertain them, but they were happy. Coming back home, our flight was during their usual nap time. They were tired and they had a difficult time getting comfortable. Olivia was finally able to find a comfy spot laying on me and fell asleep for almost an hour, but Juliette was never able to settle down and was more irritable. It all depends on your own child. If they can fall asleep anywhere or maybe if they travel in their car seat then it’s probably not as big of a concern. Children under two can sit on your lap free of charge during flights. You just have to bring a birth certificate to confirm the child’s age. The important thing to know when flying with twins is that only one lap child is permitted per row because of the limited number of oxygen masks. That means if you have a family of four who wants to sit in the same row then one twin would be a lap child and one twin would need his/her own seat. We bought an extra seat for the girls and were so happy that we did. Having the whole row to ourselves meant there was less opportunity to bother our neighbors on the flight. It also gave the girls a little room to wiggle. During the flight, they were both able to fit in the seat together which gave our arms a much needed rest. Isn’t it Murphy’s Law that says that if something can go wrong, then it probably will? 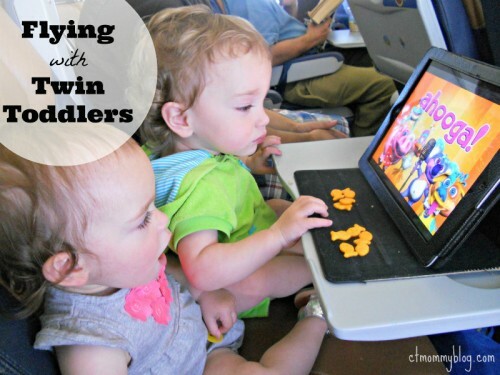 Keep this idea in mind when planning for your flight with toddlers. During our trip to Florida, the whole family came down with some form of the stomach bug. It was not a pretty sight and I was so worried that someone would get sick on the plane. Thankfully we avoided the plane sickness altogether, but I cannot guarantee you the same great fortune. So prepare yourself for the worst possible outcome and hope for the best. Think ahead and pack your carryon accordingly. I made sure that we packed an extra pair of clothes for each member of the family including the grownups. I packed twice the amount of diapers and wipes that I typically bring. I came armed with Tylenol (adult & infant), Benadryl and gas drops. 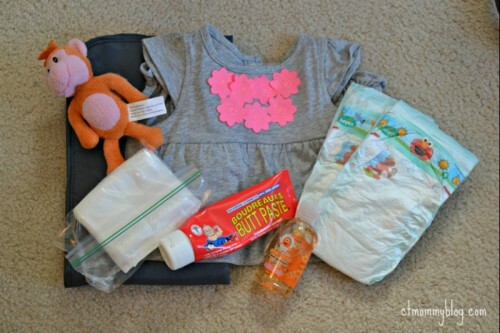 I even created a small bag specifically for changing the baby on the plane. It included diapers, wipes, a change of clothes, changing pad, diaper cream and a small toy. I was able to quickly grab it when I needed to change a baby. I was sure that I had everything in one spot without having to carry a clunky diaper bag PLUS a baby through the narrow plane aisle. 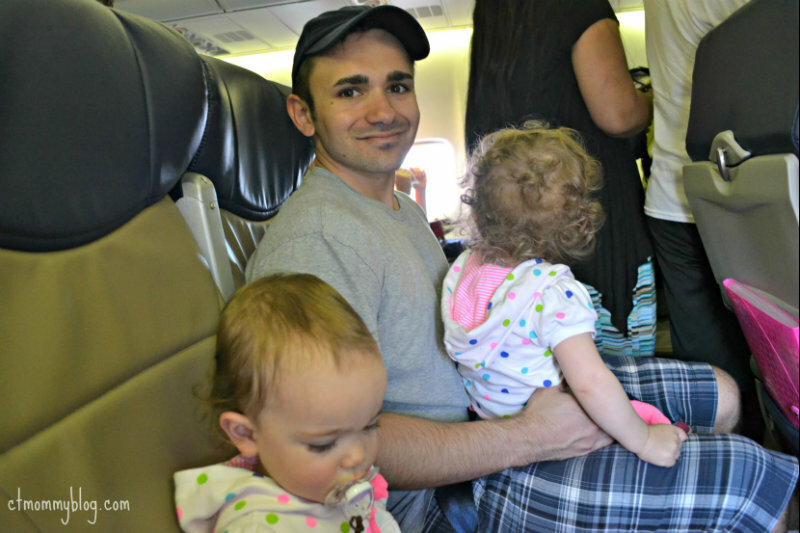 Being confined to your tiny plane seat can make anyone go bananas, and toddlers are no exceptions. When your little one is used to running, crawling, and climbing, having to stay still for any extended period of time can come as a shock. This is why the entertainment is so important in distracting your child from the reality that they can’t move around like they are used to. 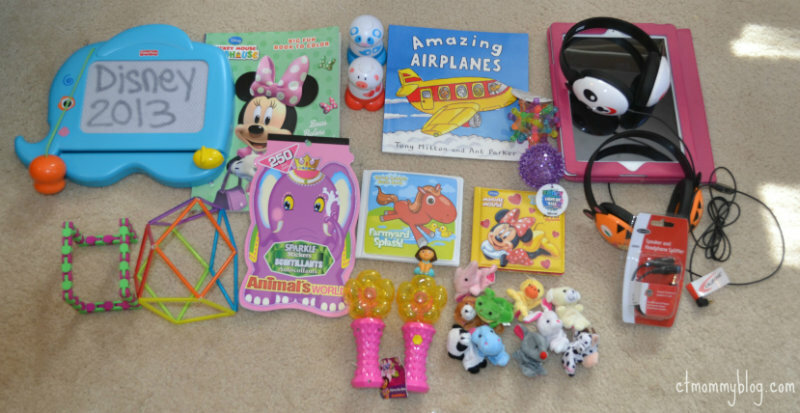 Check out the complete list of travel toys and entertainment that I brought along on our flight. I searched for weeks for things to bring on the plane that my girls would find enjoyable. I ended up filling a bag full of new and interesting things. I included an iPad with child headphones, stickers, coloring books, toddler crayons, finger puppets, light-up toys, books, sunglasses, and a doodler. Some toys they played with for only a few minutes (but on a plane a few minutes of quiet time is priceless!) 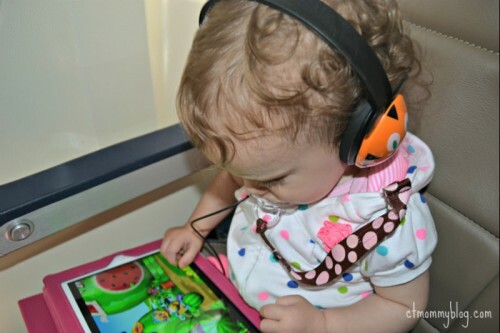 and others, like the Giggle Bellies app on the iPad, kept their attention for extended periods. On our flight to Florida I brought too many carryon bags. I had my diaper bag stuffed with entertainment, food, and diapers. I also had my own carryon bag of things I don’t like to put in my checked baggage. Plus, my purse. Carrying all of those bags plus a toddler down the tiny aisle of the plane was nearly impossible. I was bumping people, bumping her. It was a mess. On our flight home I checked my original carryon bag and included any essential items in Chris’ carryon backpack. 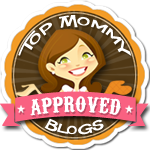 I strapped Olivia in this baby carrier that is perfect for larger babies. It kept my hands free and made the whole process so much easier. If I were to do it again, I would use a backpack for the twins’ diaper bag to simplify things even more. All of my planning for our girls’ first flight paid off. It wasn’t easy and required a lot of work, but we were successful. There were no meltdowns and I would say they did great considering how stressful flying could be. I even learned a few things along the way that I will try on our next flight!